Adjacent Dangers – Love. Life. Practice. That used to be one of my favorite sayings. I used it as a realistic riposte to those optimists who annoyed me with a pollyannesque view of the world, especially in my cynical days. I’m far more optimistic about the world now, and not only because it’s simply more fun. I’m also optimistic because I’ve learned, the hard way, that limits are always going to be transcended. 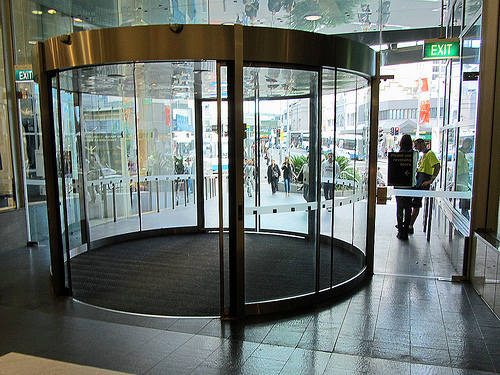 For example, in many hospitals and some modern malls the revolving doors are gigantic slow-moving monstrosities that could be more accurately termed “revolving rooms.” More to the point, if you were wearing cross-country skis, you could easily ski through them. There are other, not-so-fun examples of this, such as another suggestion I give people when they start relationships: “Listen to what they say they’ll never do. And then prepare for when that happens.” I know, sounds terrible, right? And yet I’ve found that the whole self-fulfilling prophecy thing seems to be in evidence over and over again, in big things and little. It’s not a happy or sad or right or wrong thing; it’s just something that happens, like gravity or taxes or reruns of Law & Order. There are probably some of you who say that the suggestion itself is a self-fulfilling prophecy, which to me seems like saying gravity didn’t start working until Sir Isaac gave it a name, but hey, we can agree to disagree. More to the point (and to take the post in a more cheerful direction) this is the time of year when people both reflect on the past year and express intentions for the year to come. 2013 seems filled with potential, to me. It feels like a good year, one that has a lot of work that needs to be done but where that work feels possible. The President I hoped for is in office, there’s nine months of Mars Rover Road Trip to follow along with, and I’ve finally got the free time to enjoy more of the books and tv shows that I’ve ignored for the past five years (TRUE CONFESSION: I’ve only seen part of the very first “West Wing” episode. I know…but hey, at least it’s treatable). I’m excited about the work I’m doing, both for clients and for myself, and (so far) I seem to be pretty on track for not traveling as much this year as last year (or the year before) while still satisfying some wanderlust. Most of these changes, though, have more to do with environmental changes. Moving to a less expensive part of the country means that I have to spend less time chasing money, and can spend more time on my art. Moving closer to my family gives me the opportunity to practice saying “yes” – “Yes, I’ll watch Harvey” “Yes, I’ll go for a run” “Yes, I’ll go with you and Victor to Great-Grandpa’s house.” Having my workspace set up in a place that it can stay up (I hear they call this place “the Office”, but I am still calling it “Gray’s Magic Wordmaking Machigizmological Environment”) means that I have time to think, and slows everything down. We are adaptable creatures, as is proven by the frozen wasteland that Wisconsin becomes this time of year. It’s easy enough to change, adopt, or eliminate a habit by changing the world around you. The harder resolutions are the things that don’t come so easy. Getting rid of your car may make you walk more, but it’s not going to get you in shape for a marathon; you’d need to have some zombies in the neighborhood chasing you around to really shape your environment towards that end (there’s an app for that, by the way). I was idly playing with some goals I had in mind for this year, but they seemed kind of unrealistic. I’ve submitted about four stories to anthologies this past year, with a fairly good acceptance rate; I would like to do more, and I was attracted to the idea of writing and submitting a story or article every week for the year. I also have other blogs that I’ve neglected as I focus on this one; I’d like to write about cigars, for example, and other subjects. Getting back into the world of podcasting would be nice. But I already have a workflow of three blog posts a week; was it realistic to up the ante to five a week? I’ve written about twelve thousand words of a book about Open Space conferences in my field, and there’s at least forty thousand or so to go; was it realistic to think I could write the other fiction and non-fiction books in the space of a year? Then I read about how one of the social mediarati (I think it might have been Julien Smith) produces six or so blog posts a day, while also writing articles, books, podcasting, and appearing at public speaking events. I read about how Maria Popova starts her day by creating FIFTY or so interesting entries for Brain Pickings while standing on a wobble board, no less. A writer who I don’t know personally but whose tweets I enjoy recently posted a “Woohoo! 50 submissions for the year!” tweet. Woohoo indeed. Remember how I talked a while back about the burden of great potential? One of the corollaries is this: if you know something can be done, it suddenly makes it much harder to believe that you can’t do it. Knowing that something has happened in the past suddenly makes that adjacent possible where you are the one doing it much more apparent.